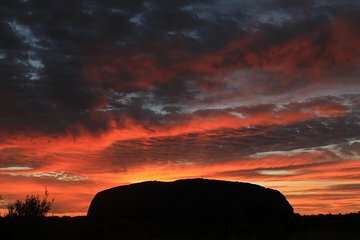 Marque todos los aspectos más destacados del Centro Rojo de Austrlia en esta aventura de 3 días en el interior de Alice Springs. Embárquese en una caminata guiada por el espectacular Kings Canyon, disfrute de las impresionantes vistas del icónico Uluru y vea las impresionantes formaciones rocosas de Kata Tjuta (The Olgas) mientras explora el Valle de los Vientos. Eso no es todo: aprenda sobre la cultura aborigen en un Mala Walk guiado, pruebe el típico tusser bush australiano y acampe bajo las estrellas en un botín o tienda tradicional. Acampe en el interior y pruebe el típico tusser de bush australiano. Transporte en autobús con aire acondicionado con un máximo de 21 pasajeros. Bit challenging, but great Esperance. The guide, Ewel, put lots of effort to give us a great outback experience with food and way of life. Very nice and beautiful tour. Interesting. Super guide. A very touching story about Aboriginal life. A bit frightening insects. : Beautiful. been brilliant, the info about the itinerary was a bit off but all good in the end. : it has been freezing -4C so bringing more warm clothes would be good to advise! It was a great tour. Our tour guide was Ange and she was the best - a real superwoman! Be prepared for very early rises but it's worth it. Meals are simple but sufficient, and the pace is not too hectic, fairly reasonable. This tour was ok, it followed a similar itinerary to the others of similar value in the area, but the food was a joke. In the evenings it was a cooked meal that wasn't too bad. However, the lunches and breakfasts were terrible. The first 'lunch' was a badly made sandwich a couple of thin slices of cheese and a square of ham with an apple. The following two lunches consisted of the following presented in its original packaging, i.e. in tin cans and plastic bags: two tins of tuna, two tins of sliced beetroot, a tin of sweetcorn, a bag of lettuce, a bag of cheese, a bag of sliced ham, a bag of bread wraps. Not only were they served up in the cans and bags, but they were served on the second day particularly in environments where there were hundreds of flies. The food instantly became black with flies and in order to eat it, we had to scrape it out of the tins along with the flies which then went onto our flatbread. The breakfasts were cheap sliced bread toasted by a camp toaster which became very hot - no tools to use this, cereal and milk. I have since spoken to other travelers who went on similar trips of the same price and they said that their food was amazing, with barbecues and lots of choice, and plenty to drink, and served in places that were covered and protected from the flies. I understand that the outback is notorious for its flies, but literally the food was black with them. I've never seen anything like it. People didn't eat lunch on the second day which was the worst day. That aside, the quality of the food itself at lunch and breakfast was terrible, the evening meals were ok, but nothing like the barbecues and bush tucker that were going on in other tours of the same price. Appalling. I feel totally cheated and disappointed by this tour, they obviously had a very low budget for the food. I didn't expect 5star, but this was disgusting. Everyone on the bus had the same feeling. I trusted Viator before, but now I'm not so sure.